Massimo de Mattia is a flutist and composer from Italy, who through his music, explores and synthesizes the works of 20th century artists (visual, theatrical, and musical). 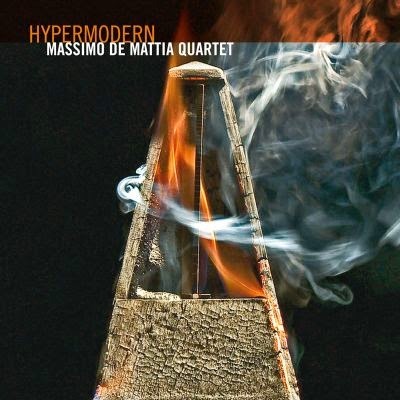 He leads his quartet (with Giovanni Maier on doublebass, Luigi Vitale on vibraphone, marimba, percussion, and Alessandro Mansutti on drums and percussion) on this latest album, Hypermodern. It is an excellent work, evoking third stream, chamber jazz, and improvisations. In fact, two artists that come to mind are Chico Hamilton and Walt Dickerson, Hamilton's classic 50's works with Fred Katz that are models of chamber jazz, and Dickerson's 70's works that were introspective, forward thinking works of improvisation. The opening track, "Lands Beyond," sets the tone as Vitale (whose vibes are featured throughout the album) and Mattia set up an atmospheric landscape that is lightly accented with Mansutti's drums and Maier's brief but angular bass. The volume of playing is low, creating an intimate listening space that sets up the dynamic and intricate interactions. The title track, "Hypermodern," seems like it was pulled right out from a 60's Blue Note session with Bobby Hutcherson, with Mattia playing a Sam Rivers like aggressive flute over Vitale's pulsating vibes and Mansutti's low key but driving persussion. It is the strongest and most active track on the album. "Zeit" has a far eastern feel, with Mattia's minimal phrasing and the group's percussions. "Proxemics" is another lively tune, Maier being very active with his bass plucking, Mattia's aggressive flute dancing on top of Mansutti's drums, and Maier's choppy cello strokes, ending with a frenzied funky improvisation, then promptly quieting down to silence. The album's closer, "Way Out," reminds this listener of an exotica tune done free impov, a "Quiet Village" meets Dickerson and Dolphy. Very unusual, but it works. Hypermodern is a fine album full of stimulating and provocative pieces done very intimate. Highly recommended.